So it's true. My little sister getting married! Last time when I visited Poland, I convinced her and her partner to take some engagement shots. Yes I had to convince them, as they don't like to be photograph even by the family member :) We went to the close by forest at sun set. Session lasted 1 hour as mosquitoes were unbearable! To create this pictures I used Nikon D800 + 28-300mm + flash light with umbrella. In post processing stage I was inspired by movie look, and green/yellow background colors. On the location we had few probes prepared earlier like posters, love wooden letters, scrabble tiles, engagement ring, apples, medals (as both are runners) and Sylwia and Marcin amazing, bubbly personality that made this photos diverse. 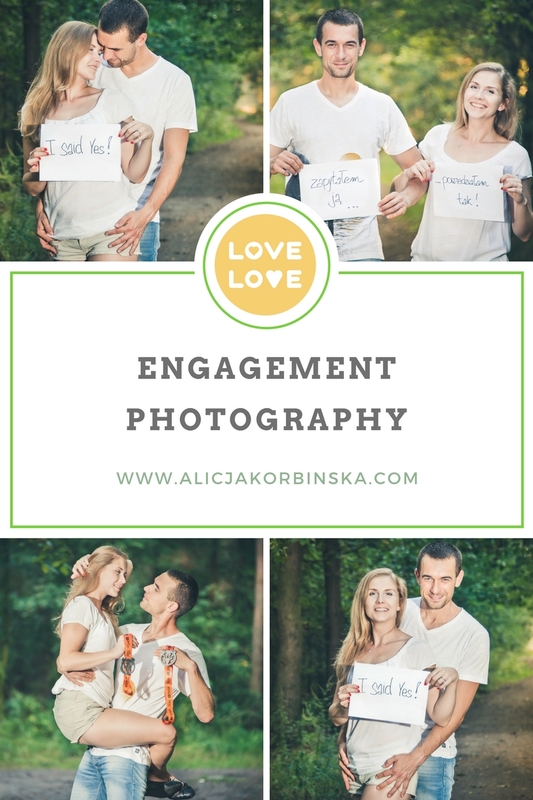 If you are planning your engagement photo session, you may want to have a look at the photos below, and get familiar with couple's posing, get inspired with your location, or even how you'd like your final photo look like. Should you need some more info about portrait photography, to easy your choice, please read this article 'Introduction to portrait photography - Determinate your expectations'. I wish you all beautiful engagement photos to keep this precious moments for longer!